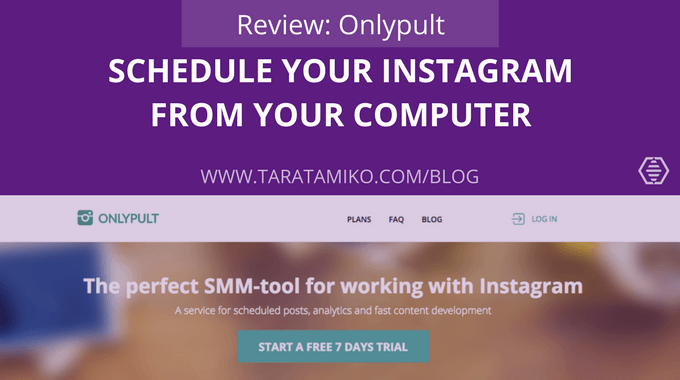 Onlypult makes life easier for social media professionals who are juggling more than one Instagram account. And, even if you’re only managing one account, this Instagram tool will become indispensable to you. You never have to open Instagram on your phone again. Automatically post to your Instagram account while you sleep. 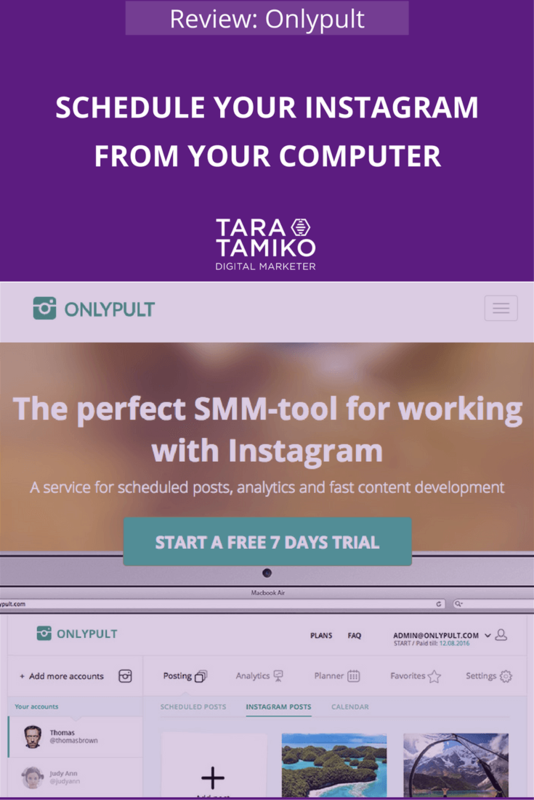 Onlyput makes developing your Instagram strategy a breeze. Sure it will post directly for you, but that's just the tip of the iceberg. Hashtags at your fingertips, including your own ones, makes this a must have for any social media professional. This content uses referral links. Read the full disclosure policy. Anyone else tired of having to use a text app to copy and paste your hashtags? Hallelujah, you can manage up to 40 Instagram accounts at once. And don’t worry, you won’t have to share passwords. By adding others as as a team member on Onlypult, you keep the Instagram accounts’ passwords safe and can still have more than one person manage all Instagram accounts using their Onlypult login details. Perfect if you use VAs. Step 1: Grab an image from your computer or from a URL. Step 2: Select the size you’d like to post. When you write your caption, you can add emoticons, geo tag and hashtags. Add your hashtags to the first comment section, schedule your post and save. That’s it. Actually, that’s not it. Because you also have the option of using the Planner, which allows you to set predetermined days and set times your posts are published. 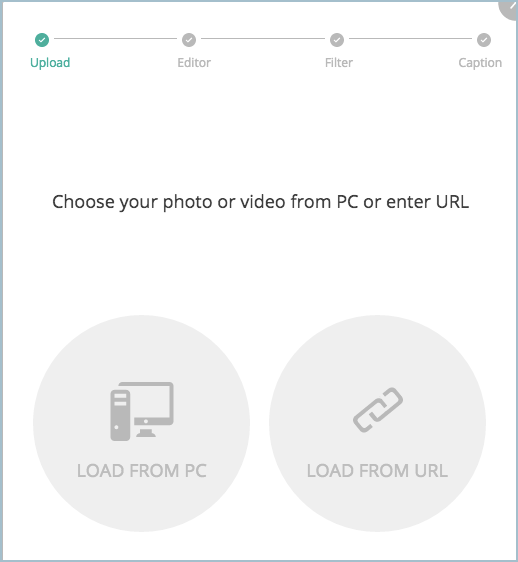 You have the option of uploading a single image or multiple images. And here’s where it gets fantastically genius, as well as a little tricky. Let’s say you want to upload 7 images and use the same caption and hashtags in each post. 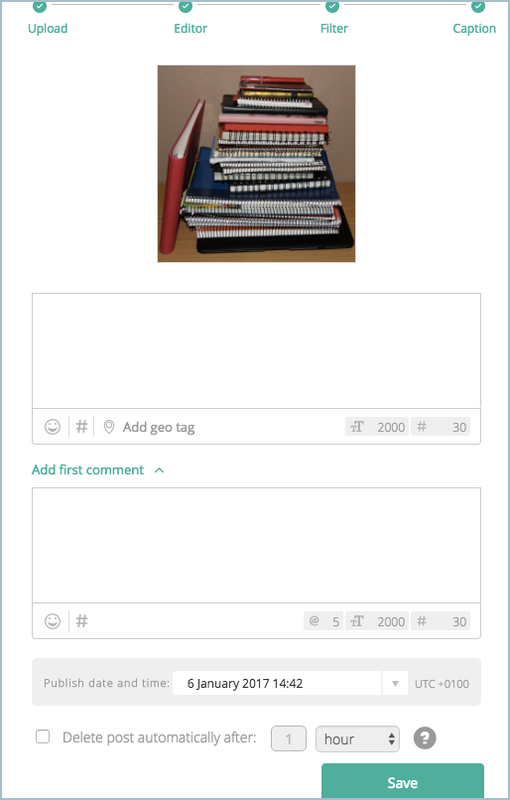 After uploading using the multiple image upload option, you’ll able to add a general description (caption) and a general first comment. What this does is automatically copy and paste the same text to all 7 images. Why would you want to do that and what does it look like? I recently uploaded my logo to be spread over 6 images. I uploaded all the images and selected general description and wrote my caption. I hit “add”, and all 6 of my posts were populated with my caption. No fiddling with copying and pasting. Magic. Didn’t I tell you it was genius? Obviously, I wanted to use the same hashtags, so I added them to general first comment, and I was done. Hit save, and that’s it. I don’t know about you, but that’s how I like my social media scheduling. Simple and painless. What’s the tricky part I speak off? Please make sure you have good Internet connection because if it drops out in the middle of this, there’s no auto save and you’ll have to start over again. As well as the ability to repost other Instagram users’ posts, you can use Onlypult to search hashtags and track up to 10 other user accounts (small team plan). This is perfect for reposting users’ content and giving them full credit. You have the option of using the repost mark or not. Always give credit in the caption to the Instagrammer’s images you repost. General description and general first comment, a.k.a. write it once, have it populated to every post you’ve bulk uploaded. This is perfect for when you break up a large image into several posts and want to use the same caption and first comment. We all know that measure, measure and measure again is a number one priority, so you won’t be disappointed with Onlypult’s analytics feature. You’ll be able to get stats on your followers, how they’re engaging with your content and set your Planner to the right days and time to post for maximum interaction. A few other things you’ll like about Onlypult. There are many plans to choose from making trying it out easy. Their customer service is beyond a great experience. Fast, friendly and helpful; you can’t ask for anything better than that from any online service you use. 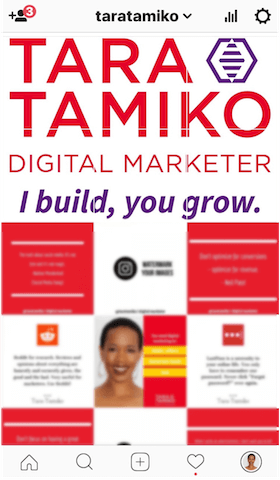 You can choose to instant message them from the site, or send them an email; you’ll find their email address on the footer of every page. If you manage more than 3 Instagram accounts from the same IP address this could cause problems and cause Instagram to ask you to reauthorise your account. To avoid this problem you should use a proxy. This means you can use a different IP address for each Instagram account. The proxy feature is included in all plans. You can edit a published post and edit your Instagram profile; all from your desktop using Onlypult. Sweet, right? Being able to carry out these actions in three separate stages would require being able to hit a save button. Sometimes, we’re at the mercy of our Internet connection and I’d like to be sure that my bulk image upload isn’t lost if my Internet connection drops out. Another area that could do with a tweak is My Tags. I like to theme my days and weeks, so rather than having one long list, being able to group my personalised hashtags would add an extra lifeline to my scheduling activities. Fortunately, both of these features are on the roadmap so Onlypult will make an already easier life easier when they rollout these two features. Overall, Onlypult not only wins my vote but also will keep it. I’ve tried others, but regarding saving time as well as ease of use, Onlypult wins hands down. You can get started with Onlypult by taking advantage of their free 7-day trial. Are you already using Onlypult, what’s your experience? If not, does this sound like a tool to try? Do you use a different scheduling tool? Pop your comments below. can you use ONLYPULT with a personal instagram account or does it have to be a business account? It’s a grey area because they don’t use the API to post. They use device farms. Schedugram does something similar…as do Grum. Yet, they’ve been around for quite some time. Onlypult offers a bit more for the cost. Why not try their trial. Hope this helps!